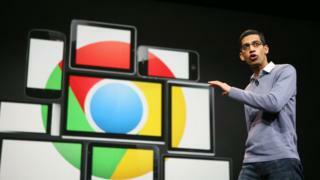 Blocking ads could become much harder if Google makes proposed changes to its Chrome web browser, warn developers. The changes could "destroy" ad-blockers, said one maker of widely-used blocking software. Others said the update would make it far harder for users to stop firms tracking them online and make it easier for them to be bombarded with ads. Google said the proposals were a "draft" and added that it would work with developers to limit their impact. "This would basically mean that Google is destroying ad-blocking and privacy protection as we know it," said a statement from ad-blocking developer Ghostery given to the Gizmodo tech news site. Ad-blockers are a type of add-on or extension for a web browser that, as their name implies, try to spot and stop the commercial messages found on many web pages. There are many different types of browser extension. Ghostery's comments were echoed by Raymond Hill, head developer of the popular uBlock Origin add-on for Chrome, who said the extension would "no longer be able to exist" if the changes were enacted according to the current proposal. In a message put on a key discussion list for Chrome, Google said it wanted to make the changes to improve the "security [and] privacy" of extensions and improve their performance. Often, it said, when add-ons examine incoming data, web pages take longer to load. The row has blown up over Google's plan to stop extensions changing data they receive from the sites that users visit. This ability to block, modify or redirect incoming data is key to the extensions' ability to stop ads and pop-ups, as well as to thwart attempts to track users or seize their data. The proposed update would mean extensions can only look at the incoming data rather than alter it. "I don't see what is to be gained from doing this," Mr Hill from uBlock Origin told The Register. Other developers pointed to separate proposals that could also restrict the ability of browser extensions to protect users. Following the comments and criticisms, Google said it planned to consult with the makers of browser add-ons to limit the changes they had to make. "This design is still in a draft state, and will likely change," wrote Google software engineer Devlin Cronin in a message put on the Chrome discussion list. "Our goal is not to break extensions," he added. Would you pay for an ad-free internet?